There may still be snow on the ground where I live, but I grow increasingly excited as the days grow longer and the sun pushes through the gloom of the long Danish winter. For months on end, we here are caught up in perpetual twilight, longing for the perfume of spring in the air. Well by Danish standards Spring may still be a month or two away, but celebrated British shirt-makers Washington Tremlett have predicted the seasonal change with their late 2009 release Hampstead Water. Keeping in line with their olfactory tradition of sophistication and impeccable grooming, Hampstead Water is a cologne that brings with it, all the aromas of the vernal equinox. It is an aromatic fougere which is both transparent and complex: one that exemplifies the flourishing greenness of Hampstead Heath in England after the rain. Just as the spring sun climbs in the sky, drawing dampness from the earth and promoting new growth; Hampstead Water is abuzz with crisp bergamot, dewy watermint and sparkling orange that collectively evoke a sense of blossoming green leaves and radiant warmth. An underlying aromatic lavender accord lends a sense of tranquility that calls to mind the green oasis that is found at Hampstead. What I find whimsical and intriguing about this cologne is a fragrant atmospheric impression of "saltiness", furnished by its cultured base of leather and musk. One can easily imagine damp rolling meadows and emerald green ponds, upon which blue-green damselflies skip and dance. Hampstead Water represents a private moment in time spent at the lake's edge as you observe the symphony of springtime play out in front of you. Clearly hoping to appeal to a younger market, Washington Tremlett have regrettably packaged Hampstead Water in a garish cyan blue box brandished with the Union Jack, but one shouldn't let this deceive you into thinking that the perfumed contents follows suit. Whilst it may be distinctly British in style, it is possibly one of the most well-executed gender neutral diaphanous fougeres released in recent times. 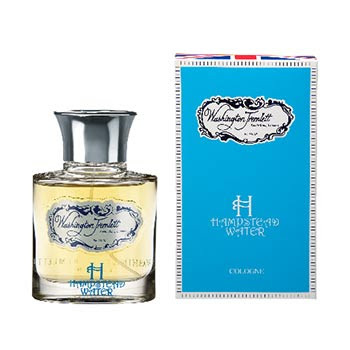 Washington Tremlett's Hampstead Water can be purchased at www.ausliebezumduft.de in 100ml size for €140.